From left: Lake Success Village Police Chief Joseph Gardella and Administrator Patrick Farrell; Great Neck Public Schools Director of Athletics David Zawatson, Recreation representative Donna Leone and Director of Facilities Alfred Cavallaro; Eden II/Genesis Programs supporter Robyn Schneider and Interim Associate Director Mary McDonald; and Greater Long Island Running Club President Mike Polansky. 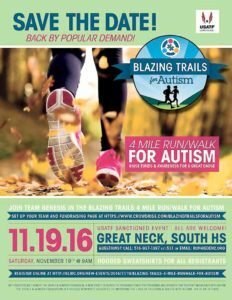 The Blazing Trails 4 Autism 4 Mile Run will be returning to the eclectic Great Neck course that served as the event’s original venue on Saturday, Nov. 19, and will offer all the amenities and excitement that runners have come to expect over the years. The challenging but fair 4-mile course covers residential streets in Lake Success before returning to the beautiful Great Neck South campus to finish on the high school track. A 1.5-mile Fun Walk will be offered to those who are overwhelmed by the thought of the 4-mile distance. Both the 4-miler and the 1.5-mile Fun Walk will start promptly at 9 a.m. The event is USA Track & Field sanctioned, and the 4-mile course is a USA Track & Field certified course. Each entrant in both the run and walk will receive a unique commemorative hooded sweatshirt. Awards in the 4-mile run will be given to the top male and female overall finishers, the top male and female masters finishers, the top three male and female finishers in each of 17 age groups ranging from 12 and younger through 85 and older, the top three Clydesdale and Athena finishers in each of two weight divisions and the top three wheelchair finishers. Timing and scoring will be provided by Just Finish using the RFID computerized-timing system with the throwaway chip attached to each participant’s bib number. Musical entertainment will be provided throughout the morning and great post-race refreshments will be served, including the ever-popular array of baked goods supplied by All Round Foods. The highlight of the giant post-run raffle will be a road bike, complete with a helmet and accessories valued at more than $1,000, generously donated by Brickwell Cycling/Multisports. Other key event sponsors are the EJ Foundation, Anton Media Group, Medtrack, Trader Joe’s, Best Market, Panera, The Haley Family, Genesis PTO and CBSR Citrus Distributors of Tropicana. The coordinators are grateful to the Great Neck School District, its Board of Education and Superintendent of Schools Dr. Teresa Prendergast for their cooperation in staging the event at Great Neck South High School. The event’s entire net proceeds will benefit the Genesis Foundation and Eden II, whose mission is to support people with autism throughout their lives to help them achieve their full potential through service, science and passion. Established in 1976, Eden II Programs began with just six students and one special-education teacher. Today, the organization serves more than 100 participants on Long Island and nearly 400 participants throughout the five boroughs. Online registration is open through 5 p.m. on Nov. 17 at www.glirc.org. 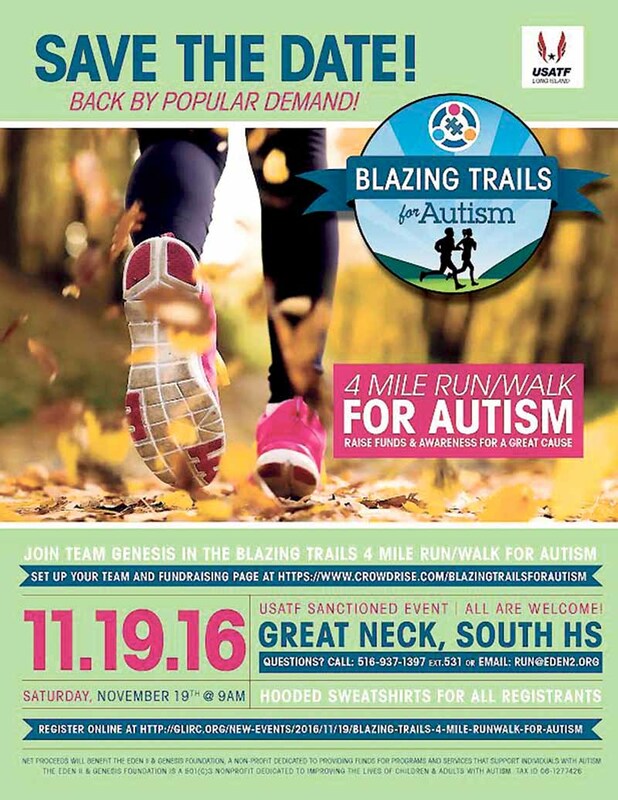 For paper entry forms or more information about the event, call the Greater Long Island Running Club at 516-349-7646. To volunteer, contact Mike Fernandez at mike.glirc@gmail.com.